When I first heard about and tried Cohérence outerwear last year, I wasn't sure it would be for me. I tend to favour outerwear that flatters the figure and creates a straight-cut silhouette. So long in the body, slim at the waist and high in the collar. Proportions largely drawn from traditional tailoring. And I tend to prefer natural materials in rainwear, so cotton garbardine or Ventile rather than synthetics. However, since seeing Cohérence more - and in particular stocking it in our pop-up shop last month - I've come to love some of the models. 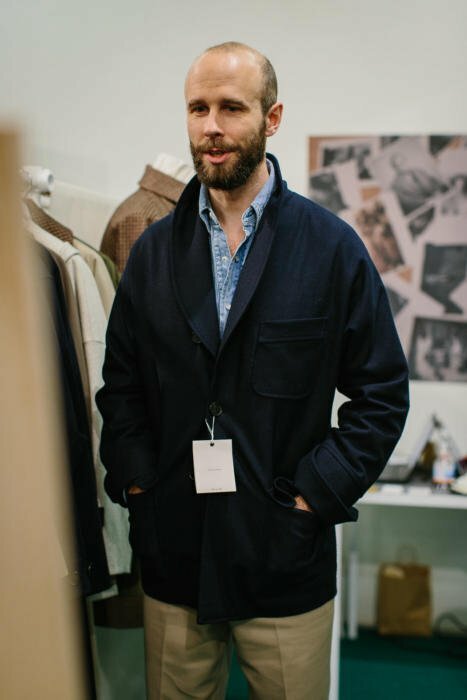 I also think it's worth everyone understanding where the brand is coming from, as it is a genuinely original voice in a market often dominated by very traditional Macs and trench coats. 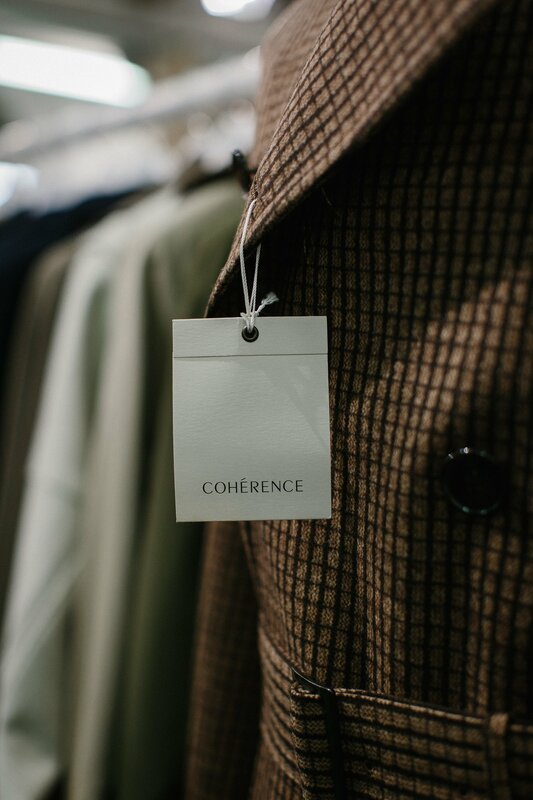 Cohérence is the brain-child of Kentaro Nakagomi, an industry veteran whose career was largely spent designing for a European brand, and managing European production. "You'll see some small details that come from tailoring around the coats," Nakagomi says. 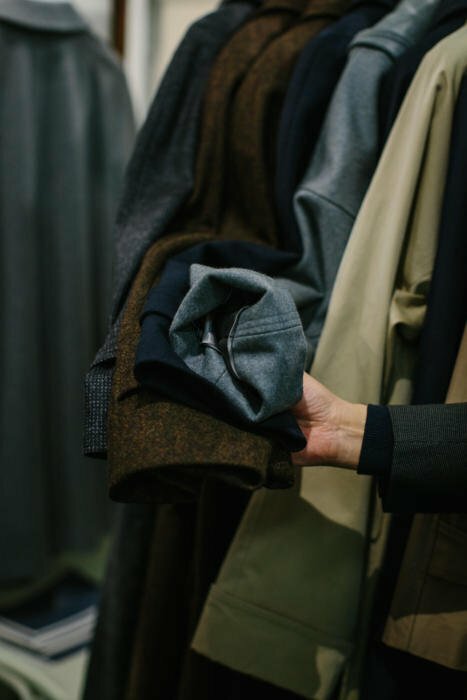 "For example, the armholes tend to be smaller than on most modern outerwear, to create freedom of movement in the same way a bespoke tailor tries to." 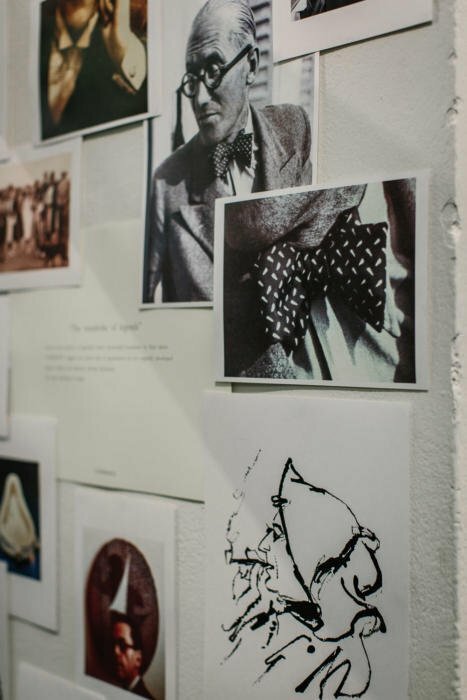 His designs all begin inspiration with images of artists, musicians and film stars of the first half of the twentieth century: Camus, Tzara, Matissse, Duchamp, Le Corbusier. Nakagomi uses specific images of the stars wearing pieces of outerwear, and then refines them with the use of a physical archive. As a result, the models are all named after those men. "Just copying old styles is not impressive, but each piece has some points of inspiration from vintage clothing," he says. "I always work closely with the fabric development, for example, and try to add texture and weight even to synthetic fabrics - in order to give them more of a vintage feel." The models vary greatly - from short, loose jackets to long, fitted trench coats. But they all have two things in common: a love of volume and a lovely attention to detail. So even if the trench coat is designed to be cinched at the waist (model 'Al', after Albert Camus, shown above), it has generous volume below the waist, opening into a full skirt. This is something few modern brands feel confident enough to do, feeling everyone wants things neat, slim and short. The unbelted models such as the 'Corb' (after Le Corbusier), have the same rounded, raglan sleeves as the belted, and are virtually A-line, from the arms downwards. 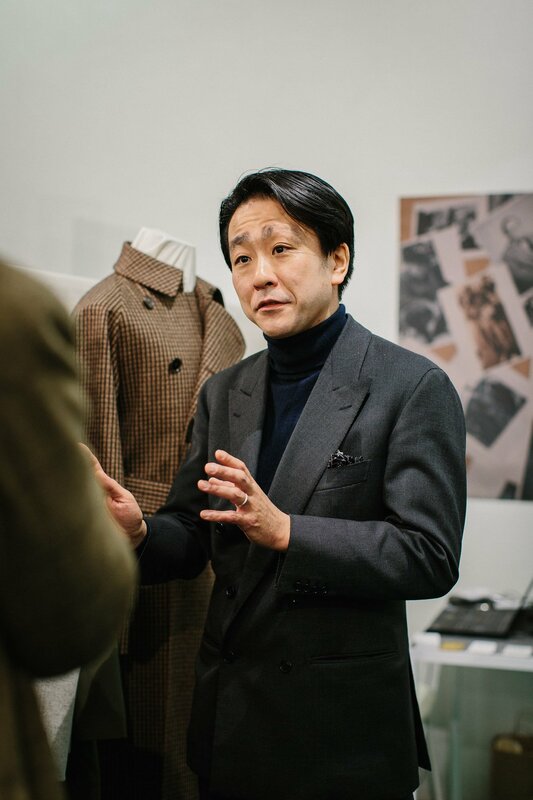 "Volume is something else I pick up on from vintage clothing consistently," Nakagomi says. "It feels generous and expressive." Examples of attention to detail are the tabs that narrow a sleeve at the wrist, which are delicately arrowhead-shaped, with beautiful subtle horn buttons; or the blackened metal hardware Nakagomi uses, instead of the cheap and more common faux-leather. There are nice cutting points too. For example, some of the raglan sleeves are cut in two pieces to enable them to be slightly shaped through the point of the shoulder. This means you can wear a jacket with some shoulder padding underneath, without the sleevehead poking up and creating an odd kink in the raglan above it. The raincoats are largely made in a synthetic jersey - which, while I like less than cottons, has a nice twill that lends it some surface interest, and some practical stretch. 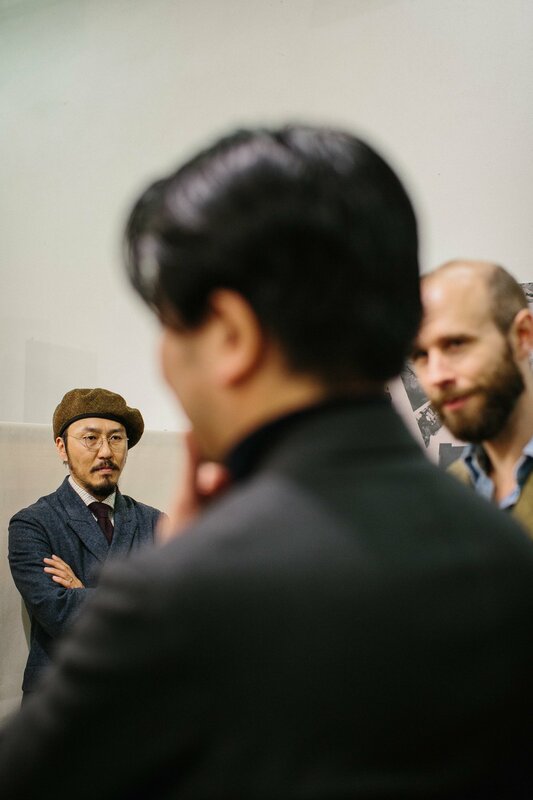 In the images here, taken at Pitti Uomo in the winter - where I met and interviewed Nakagomi-san - you can see a few of the models, as well as the texture of many of the materials. Above is the 'Henri', for example, named after Matisse. It's a slouchy, shawl-collared jacket with some nice details, although not really for me (probably because of those tailoring prejudices). This has an ingenious but very complicated internal-external belting mechanism, which finishes with two buckles on the outside at the front. You can see the Cohérence proportions, particularly in the skirt, quite clearly from this image. The Armoury are developing an exclusive version of this for Autumn/Winter 2017 with a simplified belting mechanism - which I'm keen to see. 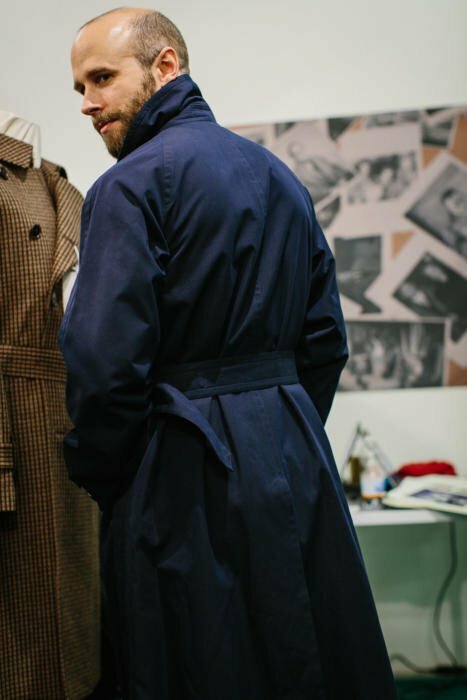 Of the rest of the models, I like the length and details of the trench coat (Al) but not in the synthetic jersey - more likely a cotton gabardine. The Armoury has stock of three models: Al, Sid and Antoine (a short, double-breasted jacket based off the leather flight jacket worn by Antoine de Saint-Exupèry). They range from $1,275 to $1,750. These can be seen on the newly launched Armoury website - as well as silk-fur liner that can button into any of the Cohérence garments ($500; a nice, practical aspect of the brand). Perhaps more importantly, they also have samples of almost all the other models, and are offering made-to-order during upcoming trunk shows with no increase in price. (A nice point, given the made-in-Japan pieces are pretty expensive already). Delivery is early October. 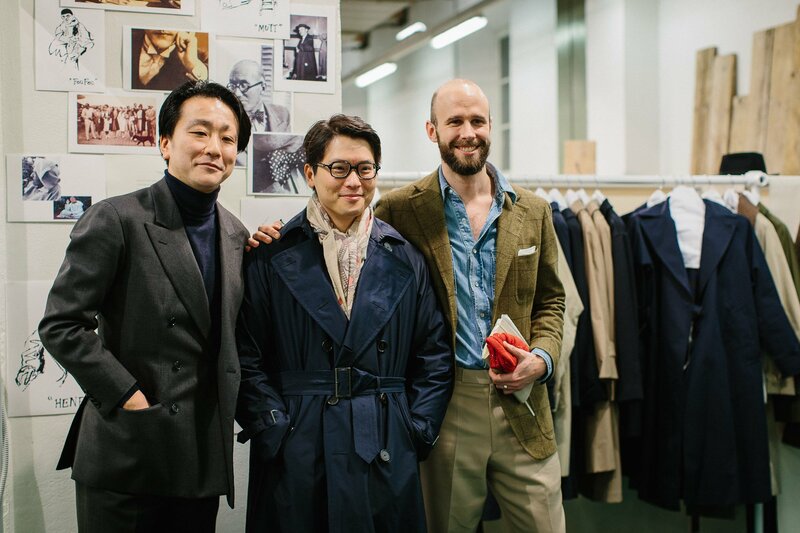 You can follow the discussion on Coherence: Vintage-inspired Japanese outerwear by entering your email address in the box below. You will then receive an email every time a new comment is added. These will also contain a link to a page where you can stop the alerts, and remove all of your related data from the site. Thanks for the post devoted to Conference. Sure, in the past I had seen mentions of their coats. But strangely enough, I didn’t really pay attention to their products, until now. Surprisingly enough, they offer the best innovation in this realm. 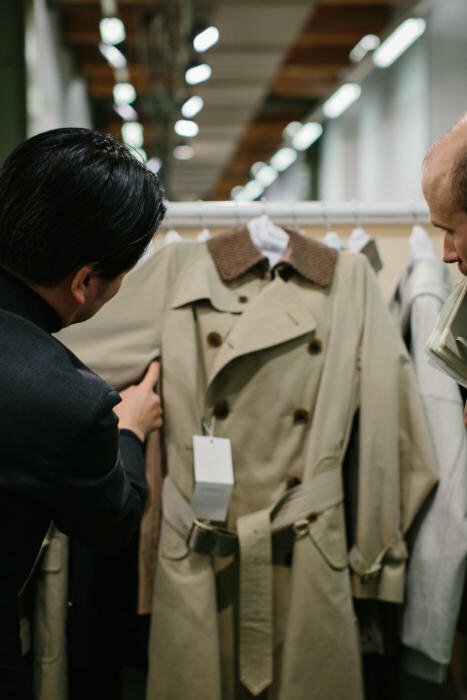 Contrary to their European counterparts that have now solely focused their sense of being innovative either on the length of their coats and raincoats or on how best to mimic military outwears. They even do not bother whether a whiff of military in a garment might be a foil to many potential costumers! Even ladies might well find the items designed for them lovely. Thank you for this very interesting and timely post, particulary as little appears to have been written on the topic of trench coats. I had seen Cohérence coats on The Armoury’s website, but did not appreciate the thought and style that went into making them. As Holland and Sherry has a trenchcoat cloth collection, have you considered having one made bespoke? This looks very interesting as does the ‘Private White’ design. ‘Trench Coats’ definitely deserve greater investigation particularly with the innovations that are taking place with fabrics. I just wanted to share the fact that I will be stocking Coherence in the UK from September onwards when I launch my new online shop. Initially I will be offering the “Henri”, exactly as pictured on Simon in the article, and the “Foufou” as highlighted in the links in John’s comment above. What is this shop called? Superb. Even better in the rumpled look of the icons themselves wearing these trenches. Dieworkwear has a nice piece about the cultural background. 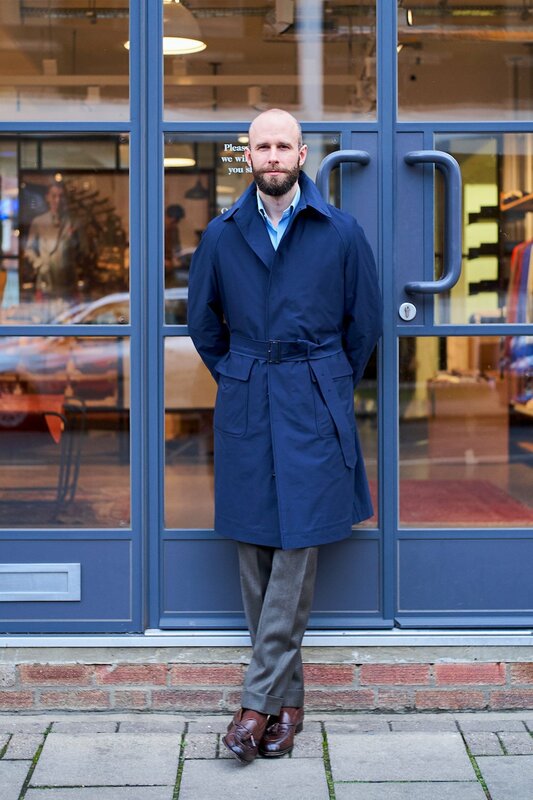 Pity that The Armoury hasn’t picked up Coherence’s Sartre-influenced shawl collar coat. Camus especially wears his with great panache. It takes a lot of practice to grow into wearing a coat like that enough to forget about it, but then again, back in the day it was much a more ubiquitous look than now. I’ll be saving for a bit to pick up one of these, or perhaps my father will part with his beige Burberry trench from the ’80s. His bigger frame might give it a suitably slouchy quality on me, we’ll have to see. Should have mentioned that the PS trenchcoat is also very nice: practical detailing that doesn’t sacrifice aesthetics. I also like the green colour, which would allow one to wear navy or cream trousers without it seeming a uniform. 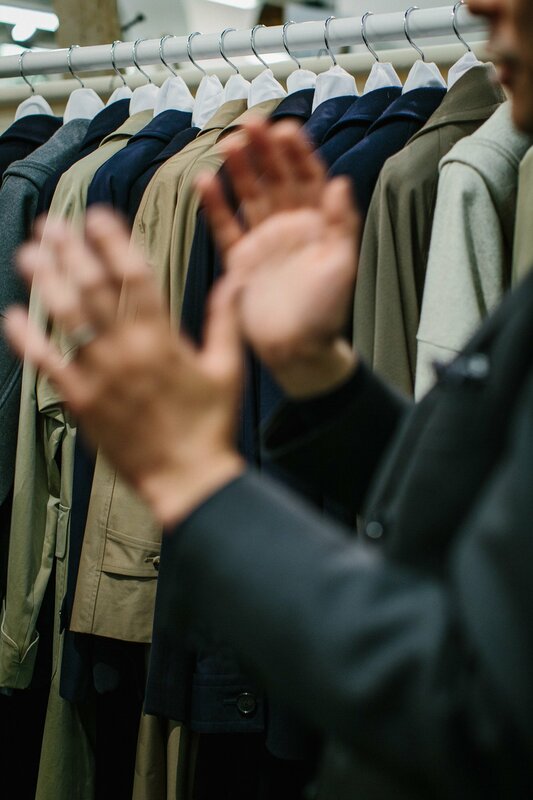 That would be my reservation about buying the Coherence Al / Camus one in beige – one couldn’t wear beige trousers without it seeming a monochromatic “mass”. The PS trench seems to have a bit more skirt / flare to it than the Coherence ones. Not having seen either in person, is that true, Simon? The PS is quite a bit longer? Thanks, David.